Walk in the footsteps of the ancients as you explore thousand-year-old stone temples and climb tall pyramids for sweeping views of a fertile rainforest valley. The highlands of western Honduras are home to one of the most significant archaeological sites in North America, but that's not all. This is also Central America's cowboy country, where visitors can stay at rustic fincas and ride across rolling hills. Shade-grown coffee thrives on nearby mountain slopes, monkeys and macaws chatter in jungle reserves, and hikers can take a break in hot springs where therapeutic mineral waters bubble from the ground to provide soothing relaxation. Honduras' premier archeological sites are found in the western part of the country, close to the Guatemalan border. The area can be reached by scheduled motor coach service from the towns of La Ceiba and San Pedro Sula, or by air charter. There are a number of modern hotels near the Copan ruins that serve as starting points for tours of the archaeological sites as well as other area attractions. While exploring temples and archeological sites, be sure to take an occasional glance into the forest. Copan sits in a lush wooded valley that is home to monkeys, guacamayas parrots, macaws, sloths, and peccaries. Access to the ancient site of Sepulturas is included in admission to Copan, but few visitors make the side trip. If the half-mile walk seems too far, you can hire a shuttle. At Temple 26, a stairway of carved hieroglyphs tells the history of the royal house of Copan. Secret tunnels run under the Acropolis at the Grand Plaza. On plantations high in the mountains, shade-grown coffee is harvested and processed the traditional way. The Maya Museum holds a full-size replica of the Rosalila Temple. Hot springs and cool streams are used in traditional healing rituals at Luna Jaguar Spa. Macaw Mountain Bird Park is home to more than 100 species of resident and migratory birds. At an elevation of 2,000 feet, Copan can be a bit cooler than coastal areas of Honduras, but you still might want shorts and lighter clothing for summer, when temperatures peak in the lower 80s. Plan for 70s on winter days, and nighttime temperatures that can drop into the lower 60s. ROATÁN - 2 FOR 1 SNORKEL PACKAGE includes 7 night hill standard accommodations, 2 snorkels daily by boat with guide, 1 night boat snorkel underwater fish ID card, reef ecology lecture & fish ID slide show, 1 dolphin beach encounter, welcome drink, breakfast, lunch and dinner daily, entrance to Roatan Museum, day excursion to Maya Key, Island Fiesta Night on the key, kayaking and stand-up paddle boards, roundtrip airport transfers, hotel tax and service charges. Valid through 12/1/19. *Discount included and averaged between two people. Additional room categories are available. 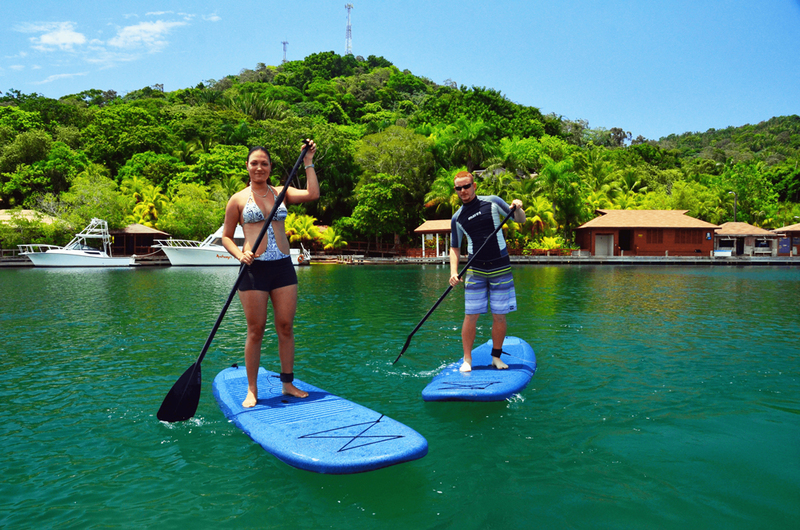 ROATÁN - 2 FOR 1 RESORT PACKAGE includes 7 night hill standard accommodations, welcome drink, breakfast, lunch and dinner daily, entrance to Roatan Museum, day excursion to Maya Key, Island Fiesta Night on the key, kayaking and stand-up paddle boards, roundtrip airport transfers, hotel tax and service charges. *Discount included and averaged between two people. Snorkel package and dive package options also available. Additional room categories are available. A valid passport is required for entry that must be valid for the length of stay. No visa is required for stays less than 90 days. The passport must have at least one blank page for the Costa Rica entry stamp. There is a departure tax of approximately $29 U.S. which should be included in your international ticket. Check the entry/exit requirements here. There are no immunizations required for entry into Costa Rica, although you should check with your doctor and with the Centers for Disease Control and Prevention for other recommendations. Costa Rica is known as the safest and most prosperous country in Central America. It is home to a large community of North American ex-pats, but also retains its distinctly Latin culture, which includes a relaxed attitude to schedules that is known as “Tico time.” Laid back is not the same as uncaring, however, and Costa Ricans are known for taking pride in their appearances and their work. A well-developed road system connects major destinations, but much of the country's central highlands remain wild and protected within national parks. Within a day's drive of beach resorts at Guanacaste lie the slopes of Arenal Volcano, the Monteverde Cloud Forest and Palo Verde National Park. Costa Rica is the eco-adventure capital of the Caribbean. Surfers come from around the world to ride famous breaks from Witch's Rock to Pavones. Coastal lodges are filled with fishermen seeking light tackle challenges with roosterfish or tugs of war with a marlin. Forests draw birders, hikers and naturalists, and there are more than a dozen rivers offering whitewater rafting thrills. More relaxing experiences await at hot springs, where spa treatments and soaks in mineral-rich volcanic water provide a soothing end to an active day. The standard in Costa Rica is the same as in the United States: 110 volts AC (60 cycles). Some electric outlets only have 2 prong sockets, so an adapter may be needed for 3 prong plugs. Costa Rica has an excellent phone system, and the country code for dialing is 506. Check with your cell phone provider for international data and voice plans and costs. Many resorts and restaurants offer WiFi. Although the water in Costa Rica is generally safe to drink, water quality varies in some cities. It would be best to use bottled water and avoid ice. Spanish is the official language of Costa Rica, but English is widely spoken. The Costa Rican currency is called the “colon”. Check the current exchange rate here. Many businesses will accept U.S. Dollars and major credit cards are widely accepted. Costa Rica is on Central Standard Time, 6 hours behind Greenwich Mean Time (-6 GMT). Costa Rica does not use daylight saving time, so the time difference is an additional hour April through October. Costa Rica is located in Central America, bordering both the Caribbean Sea and the North Pacific Ocean, between Nicaragua (to the north) and Panama (to the south). Costa Rica encompasses a total of 19,700 square miles (51,100 square kilometers). The population of Costa Rica is 4.9 Million (2015) with approximately 350,000 living in the province of Guanacaste.